From Chugwater Chili to Luxury Diner green, Wyomingites know how to whip up a mean bowl of chili. 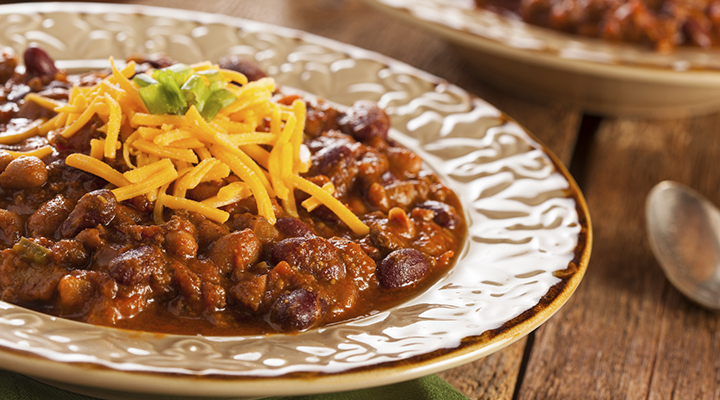 A hearty helping of chili works wonders during Wyoming winters—for your soul and smile. ° Pearly White Perk: Bell peppers are a great source of vitamin A, which strengthens blood vessels and connective tissues in gums. ° Pearly White Perk: Garlic contains allicin, an anti-bacterial property that can help prevent tooth decay. ° Pearly White Perk: Turkey is rich in protein and contains phosphorus. When combined with vitamin D and calcium, phosphorus improves tooth and jaw development and strengthens enamel. ° Pearly White Perk: Kidney beans are high in fiber, which helps defend against plaque-causing bacteria. ° Pearly White Perk: Dairy contains vitamin D and calcium, which strengthens teeth and bones, preventing tooth loss. 1. Heat olive oil in a pot over medium heat. Add onion, peppers, garlic and jalapeno. Cook until tender and onion is translucent, about 5 minutes. 2. Add in ground turkey, cayenne pepper, chili powder and cumin. Stir and break turkey apart and cook until browned, about 7 – 10 minutes. 3. Stir in water, tomatoes, red kidney beans and corn. Bring to a boil. Reduce heat and simmer until thickened, about 12 – 15 minutes. 4. Serve and top with cheese, sour cream and avocado.